It is really Good to Talk With Those Who Understand. And so you go, maybe hesitantly at first, to your First Compassionate Friends Meeting. It is a room where others “Get It”. They, too, are bereaved parents, grandparents, siblings who would give anything to have their loved one back with them, happy, healthy and embracing life together. But even in the safety of the room, you may not be able to voice what is in your heart or on your mind. Or maybe there is something that you think would make a really good topic of discussion for the group, but you just aren’t comfortable brining it up yet. 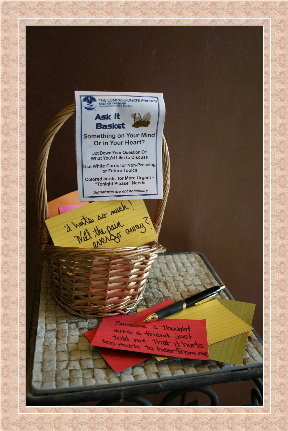 That is where the ASK IT BASKET comes into play. 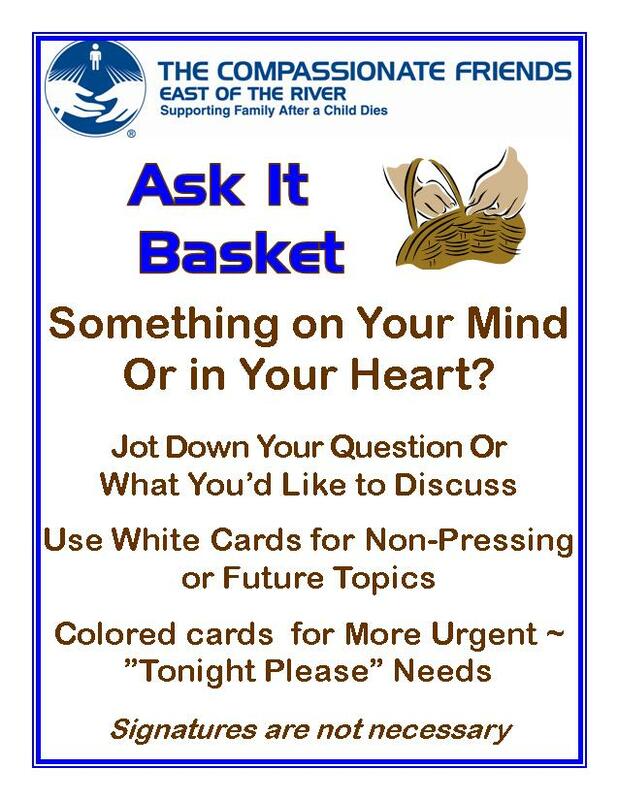 At every meeting, THE ASK IT BASKET is there to receive your questions, comments, concerns, ideas for future topics…your needs….either anonymously or including your contact information. 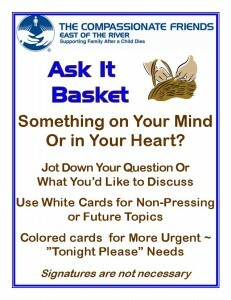 White Cards are earmarked for non-pressing concerns or suggestions of future discussion topics. Colored Cards are reserved for issues that you really WANT or NEED to talk about that evening. “I have barely heard from someone that I thought was a friend to both my daughter and myself, but other than the first month, I have barely heard from her. I felt as if I lost her, too, so I got in touch and she pushed me away, telling me that she wanted no further contact with me in this lifetime because it hurts too much to see my email address in her box. I asked her to get together to talk about it, but she refuses and told me in no uncertain terms that the door is closed. It is more hurt upon hurt. I know that there isn’t a solution, but I feel even worse than before I got in touch with her. Why do people hurt you so much more, when you are already broken over the death of your child? TCF East Of the River CT Members don’t have to wait for a meeting, though, to submit their issues or ideas. Email notes to TCFEastOfTheRiverCT@gmail.com are always welcomed, as are phone calls and everyone who desires a response will receive one promptly.